Allow me to say that the course of certain prominent portions of the New-York press is without parallel in the history of American journalism. The conservatives, falsely so called, seem to be in an agony of fear less the President is on the eve of launching the country into a war of rapine, pillage and destruction. The fanatical radicals are in a foaming rage because he makes provision for the carrying out of his proposition to the Border States representatives, even in his army orders. The New York editors tried to involve Mr. Lincoln in one fight even before he became President in March 1861. Horace Greeley wanted to be elected Senator in February 1861 — to replace outgoing New York Senator William H. Seward. Thurlow Weed — editor and publisher of the Albany Evening Journal, Republican political boss, and top Seward ally — was determined that he wouldn’t be. “A couple of newspapermen. It was an historic battle. Greeley himself did not go to Albany in February, when the legislature was to pick a senator, but he was ably represented by his assistant, Charles A. Dana, later editor of the Sun,” wrote historian Donald Barr Chidsey. “Both sides appealed to the President-elect for support, but Lincoln wisely kept out of it.”10 When Greeley seemed to be on the verge of a come-from-behind-victory, Weed threw his support to a dark-horse candidate, Albany Judge Ira Harris. Greeley was defeated and Weed was partially avenged for the key role that Greeley had taken in blocking Seward’s presidential nomination in May 1860. New York editors had two sets of enemies — political ones and journalistic ones. “‘You lie, you villain! You know you lie!’ Greeley once hurled at William Cullen Bryant, in capital letters. The author of Thanatopsis nearly choked with rage. Greeley had pilloried him in a purely Pickwickian sense, quite unconscious of the fact that he had made use of an offending idiom. Besides, Bryant had not lied. He had merely said something in a way to annoy the editor of the Tribune,” wrote Greeley biographer Don C. Seitz.12 By the time of the Civil War, these editorial disputes had subsided somewhat. They were primarily literary and political rather than the physical assaults of two decades earlier. And so a pattern was set for the Lincoln Presidency. There were political wars in New York. 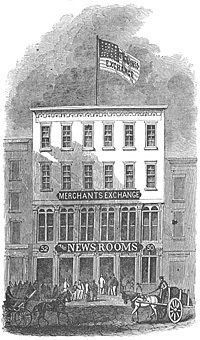 There were press wars in New York with Mr. Lincoln’s opponents. And there were press wars in New York among Mr. Lincoln’s supposed political friends — some of whom had at one time worked for each other. For Mr. Lincoln, keeping it all straight must have been like shoveling fleas. These conflicts aggravated and aggrieved President Lincoln, but he understood the importance of these editors too well than to ever cease trying to pacify them. Because some of them were as unpredictable as they were irritable, this was a trying task. The battles continued for most of the Civil War. When they weren’t criticizing each other, the editors criticized the President. The criticism was particularly pointed in the months in 1861 between the attack on Fort Sumter and the First Battle of Bull Run. The editors were impatient for victory. “Except for the Evening Post, even the administration organs turned from support to criticism,” noted Bennett biographer Oliver Carlson. “‘Wanted — A Policy’ wrote Raymond in the Times, as he tried to prod the President. He charged that the administration ‘exhibited a blindness and a stolidity without parallel in the history of intelligent statesmanship,’ and Lincoln was accused of having spent time and strength in feeding rapacious politicians ‘which should have been spent in saving the Union.”26 Of course, some of the rapacious demands for patronage came from the newspaper editors themselves. The Times was never attacked by draft rioters although it had three Gatling guns and numerous rifles to defend the premises against rioters. The nearby Tribune was not so lucky and the first floor of its offices was invaded and trashed during the draft riots of 1863. Two years earlier, the pro-South Herald was surrounded by an angry mob and escaped attack by raising the Stars and Stripe . Actually, the mob had come determined to do damage. There was no flag available, so a Herald office boy hurried out through a rear entrance, reached a Broadway bunting store, and returned with a banner in the nick of time. The flag was duly displayed, and Bennett, standing so close to it he was all but wrapped in its folds, bowed profusely to the mob. His rivals were using money profusely; Journals and influences were being subsidized against him. I accidentally learned that a Washington newspaper through a purchase of the establishment was to be turned against him, and consulted him about taking steps to prevent it. The only thing I could get him to say, was that he would regret to see the paper turned against him. Whatever was done had to be done without his knowledge. [James Gordon] Bennett with his paper you know is a power. The old fellow wanted to be noticed by Lincoln, and he wanted to support him. A friend of his who was certainly in his secrets (if it came out through a woman when a Frenchman would say, ‘Who is she? came to Washington and intimated if Lincoln would invited Bennett to come over and chat with him, his paper would be all right. Bennett wanted nothing. He simply wanted to be noticed. 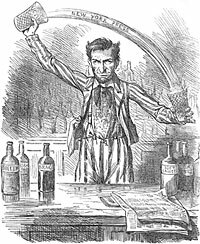 Lincoln in talking about N. said, ‘I understand N. Bennett has made a great deal of money, some say not very properly; now he wants me to make him respectable. I have never invited Mr. Bennett or Mr. Greel[e]y here — I shall not therefore, especially Mr. Bennett. Patiently Weed gathered together a quantity of ammunition about Greeley and Greeley’s friend, Benjamin F. Camp, about George Opdyke and David Dudley Field, about Isaac Henderson, one of the proprietors of that persistent foe the Evening Post. Patiently he waited for the right moment. It came directly after Lincoln’s renomination, when the Post launched an attack upon his character and raked up again the old Cataline affair. In reply Weed fired his broadside. Whenever the Post, the Tribune or Mayor Opdyke got into a tight corner, said Weed, they howled about the Cataline. To quiet their allegations once for all, he published letters from the principals in that transaction attesting his innocence in the affair. Then he turned to the attack. Greeley was accused of participating in the cotton speculations of his friend Benjamin F. Camp. Henderson, as Navy Agent was declared to have thrust his arms, ‘shoulder deep,’ into the Federal Treasury, and to have gorged himself upon ‘unclean drippings’ in the form of commissions on contracts let for the government. But it was against [ex-]Mayor Opdyke that Weed leveled his heaviest artillery. The mayor, Weed, averred, had sworn falsely that he had no interest in a gun factory destroyed in the New York draft riots of 1863, then had sat on a committee investigating the claim, and had profited by the ensuing $190,000 indemnity. 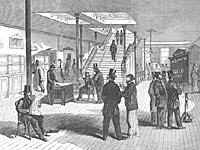 Opdyke had made more money by secret partnerships in army cloth, blanket, clothing and gun contracts ‘than any fifty sharpers, Jew or Gentile, in the city of New York.’ Furthermore, Weed declared that Opdyke, Morris Ketchum and David Dudley Field had forced themselves into the Mariposa Mining Company, a [California] concern organized to put General John C. Frémont’s financial affairs in order, and that Opdyke had participated in exactions and extortions levied upon Frémont by this company, which had mulcted the General of no less than $2,600,000. These vicious public quarrels were really only the tip of the iceberg of Mr. Lincoln’s problems in New York at this time. During this same period, Secretary of the Treasury Salmon P. Chase engaged in a feud with New York’s top Republican officials over the replacement of John J. Cisco, the Assistant Secretary of the Treasury for New York. The controversy triggered Chase’s resignation at the end of June. At the beginning of July, Greeley challenged President Lincoln to engage in peace negotiations with so-called Confederate representatives at Niagara Falls and ended up being Mr. Lincoln’s personal representative. Meanwhile, William Cullen Bryant’s newspaper partner, Isaac Henderson, was arrested for corruption by Navy Secretary Gideon Welles and Bryant demanded his release. Finally in August, Bryant conspired with Greeley and other Republicans to replace Mr. Lincoln as the Republican presidential nominee and even stalwart Lincoln supporter Henry J. Raymond suffered a political meltdown over the President’s lack of support. Long after Harvey episode faded in public memory, the newspaper wars in New York continued. Editors were never far from politics. Horace Greeley tried unsuccessfully to be elected Senator in 1862. Henry J. Raymond was elected to the State Assembly in 1860 and served as its speaker. Parke Godwin, an editor of the New York Evening Post, wrote the 1862 New York State Republican platform. Raymond, who wrote the 1864 State and National Platforms, was elected to Congress in 1864. What historian Hesseltine omitted was that the World‘s ownership changed during 1862; owner Manton Marble had to bring in new capital from Democratic political leaders such as Samuel L. M. Barlow and August Belmont. The political orientation of the paper changed with the ownership. Democratic newspapers frequently seized upon Republican fueds as excuses for their own attacks on the Lincoln Administration. For example, in the summer of 1864, the Republican Times lambasted the Republican Tribune for Horace Greeley’s role in promoting peace talks at Niagara Falls with unauthorized representatives of the Confederacy. Greeley biographer Ralph R. Fahrney wrote: “While the newspaper feud waxed warm, the Niagara incident was serving the interests of the Confederate representatives splendidly. The Peace Democrats immediately seized the opportunity to make political capital for their cause, such journals as the World broadcasting alleged favorable offers of adjustment from the commissioners, and contrasting them with the stern pronunciamento of Lincoln which involved the demand of emancipation.”56 By then, the World‘s Manton Marble had a personal grudge against the President; his newspaper had been suppressed for two days in May 1864 after it published a fraudulent presidential proclamation that threatened to destabilize gold prices. The Express was an erratic publication. It had supported the election of Mr. Lincoln but, according to Nevins, “The Brooks brothers’ Express, denouncing personal liberty laws, the underground railroad, and abolitionist publications, implied the secession was an act of desperation.”59 The Express was owned and edited by James Brooks and his brother Erastus. It was one of three prominent New York newspapers whose editors served in Congress during the Civil War. James Brooks first served in Congress as a Whig representative in the early 1850s. He was elected again in 1864 to represent the peace wing of the Democratic Party. Upstate, the Albany Atlas and Argus, edited by William Cassidy, was the house newspaper for the Albany Regency. Cassidy was related by marriage to Peter Cagger, another leader of the Democratic Regency. “Several of the most outspoken pro-slavery papers in New York were either suppressed or forbidden the use of the mails,” wrote Bennett biographer Oliver Carlson. “Of these the Journal of Commerce, the Brooklyn Eagle, the Day Book, and the Daily News were the most important. The powerful German Staats-Zeitung and the French Courrier des Etats Unis were under government surveillance; the World and the Express managed to continue through the war, though both of them were leaders of what Bennett called the ‘copperhead press. '” Unlike other Democratic papers, the New York Leader, which represented Tammany interests, generally took a pro-Union, pro-war position — in part to gain advantage over the Peace Democrats in rival Mozart Hall. “Catholic newspapers usually expressed their opposition to the anti-slavery movement in somewhat less repugnant ways,. ‘None of us, North or South, pretend to think Slavery a blessing,’ contended the New York Freeman’s Journal, a Catholic weekly edited by a non-Irishman but perceived in the antebellum years to be the organ of Archbishop John Hughes. ‘It’s warmest defenders, if they are rational, say no more for it than that it is unavoidable in the nature of things; all would be rejoined to see it abolished to-morrow, if it could be done safely, or consistently with a due regard for the rights and interests of all classes.’ However, the Journal insisted that abolishing slavery would never be safe,” wrote Tyler Anbinder in Five Points60. Of the many New York newspapers publishing in the Civil War, only two remain in circulation — the New York Post and the New York Times. Herbert Mitgang, The Fiery Trial: A Life of Abraham Lincoln, p. 161. Gideon Welles, Diary of Gideon Welles, Volume II, p. 103 (August 13, 1864). Michael Burlingame, editor, Dispatches from Lincoln’s White House: The Anonymous Civil War Journalism of Presidential Secretary William O. Stoddard, p. 90-91 (July 31, 1862). James M. Perry, The Bohemian Brigade, p. 44-45. William Harlan Hale, Horace Greeley: Voice of the People, p. 251. David Herbert Donald, Lincoln Reconsidered, p. 74. Allan Nevins, editor, Diary of the Civil War, 1860-1865: George Templeton Strong, p. 383 (December 19, 1863). John J. Turner, Jr., and Michael D’Innocenzo, “The President and the Press: Lincoln, James Gordon Bennett and the Election of 1864”, Lincoln Herald, Summer 1974, p. 67. Oliver Carlson, The Man Who Made News: James Gordon Bennett, p. 364. Don C. Seitz, Horace Greeley: Founder of the New York Tribune, p. 13. Jeter Allen Isely, Horace Greeley and the Republican Party, 1863-1861: A Study of the New York Tribune, p. 16. Jeter Allen Isely, Horace Greeley and the Republican Party, 1863-1861: A Study of the New York Tribune, p. 15. Herbert Mitgang, editor, Spectator of America: A Classic Document About Lincoln and Civil War America by a Contemporary English Correspondent, Edward Dicey, p. 31-32. William Howard Russell, My Diary North and South, p. 14. Don C. Seitz, Horace Greeley: Founder of the New York Tribune, p. 183-184. Don C. Seitz, Horace Greeley: Founder of the New York Tribune, p. 159. Sidney David Brummer, Political History of New York State During the Period of the Civil War, p. 65 (Albany Evening Journal, May 21, 1860). William Alexander Linn, Horace Greeley, p. 183. Glyndon Van Deusen, Thurlow Weed: Wizard of the Lobby, p. 257. Sidney David Brummer, Political History of New York State During the Period of the Civil War, p. 65 (New York Courier and Enquirer, May 1860). Sidney David Brummer, Political History of New York State During the Period of the Civil War, p. 65-66. Sidney David Brummer, Political History of New York State During the Period of the Civil War, p. 66 (New York Times, May 24, 1860). Ralph R. Fahrney, Horace Greeley and the Tribune in the Civil War, p. 67-68. Oliver Carlson, The Man Who Made News: James Gordon Bennett, p. 312. Ralph R. Fahrney, Horace Greeley and the Tribune in the Civil War, p. 77-78. Oliver Carlson, The Man Who Made News: James Gordon Bennett, p. 349. Charles H. Brown, William Cullen Bryant, p. 430. Ralph R. Fahrney, Horace Greeley and the Tribune in the Civil War, p. 86. Elmer Davis, History of The New York Times, 1851-1921, p. 58-59. Janet E. Steele, The Sun Shines for All: Journalism and Ideology in the Life of Charles A. Dana, p. 43. Oliver Carlson, The Man Who Made News: James Gordon Bennett, p. 315. James M. McPherson, Crossroads of Freedom: Antietam, p. 49-50. George H. Mayer, The Republican Party, 1854-1964, p. 93. Glyndon Van Deusen, William Henry Seward, p. 280. Douglas L. Wilson and Roderick O. Davis, editor, Herndon’s Informants, p. 164 (Letter from Leonard Swett to William H. Herndon, January 17, 1866). Glyndon Van Deusen, Thurlow Weed: Wizard of the Lobby, . Don C. Seitz, Horace Greeley: Founder of the New York Tribune, p. 237. Ralph R. Fahrney, Horace Greeley and the Tribune in the Civil War, p. 103-104. Gerald S. Henig, Henry Winter Davis, p. 217-218. Charles Nordhoff, Reminiscences of Some Editors I Have Known, p. 8 (Speech before the Tuesday Club of San Diego, California, March 6, 1900). Glyndon Van Deusen, William Henry Seward, p. 285. Richard N. Current, Lincoln and the First Shot, p. 107. Harry J. Carman and Reinhard H. Luthin, Lincoln and the Patronage, p. 92. Sidney David Brummer, Political History of New York State During the Period of the Civil War, p. 292. Sidney David Brummer, Political History of New York State During the Period of the Civil War, p. 293. Sidney David Brummer, Political History of New York State During the Period of the Civil War, p. 294. Oliver Carlson, The Man Who Made News: James Gordon Bennett, p. 299. James A. Rawley, editor, Lincoln and Civil War Politics, (From William B. Hesseltine, Abraham Lincoln and the Politicians, Civil War History, Volume VI, March 1960). Allan Nevins, The Emergence of Lincoln: Prologue to Civil War, 1859-1861, Volume II, p. 337. Robert S. Harper, Lincoln and the Press, p. 122. Allan Nevins, The Emergence of Lincoln: Prologue to Civil War, 1859-1861, Volume II, p. 338. Tyler Anbinder, Five Points: The 19th-Century New York City Neighborhood That Invented Tap Dance, Stole Elections, and Became the World’s Most Notorious Slum, p. 304. Michael Burlingame, editor, Dispatches from Lincoln’s White House: The Anonymous Civil War Journalism of Presidential Secretary William O. Stoddard, p. 128 (December 1862).